Lapses in workplace ethics vary in size and impact, often resulting in policy development. Included are 16 examples of employees failing to practice fundamental workplace ethics. Judgment traps and biases can hamper ethical decision-making. Such traps and biases are identified along with interventions. The PLUS Ethical Decision-making Model combines a seven-step ethical decision-making process that incorporates organizational policies, legal and regulatory concerns, and universal and personal values. Low-key, apparently innocent lying can lead to significant patterns of lying in time. Three simple strategies are offered that can help individuals prevent that from occurring. Social media use by employees not only jeopardizes productivity, but organizational security as well. Associated policies need to protect privacy and security concerns. Ethics training needs to address the emotional, psychological, and moral challenges that individuals face when confronted with ethical decisions. What kind of person do you see when you look in the mirror? That is, when you do an ethical self-assessment what kind of person do you see? Peter Drucker called that question "the mirror test" or the "ethics of prudence." "There is one and only one social responsibility of business—to use its resources and engage in activities designed to increase its profits so long as it stays within the rules of the game, which is to say, engages in open and free competition without deception or fraud." The 20th century witnessed changes in corporate America with respect to the relationship between business and the general public. Today, businesses are challenged to increase their social responsibility. The article examines the origins of the fiduciary concept in shaping the ethical and moral duties of managers. Several studies are cited including the responsibility of corporate boards having "a fiduciary duty to make ethics-based decisions." The right thing to do is also the profitable thing to do. Companies should practice the four pillars of conscious capitalism: ensuring conscious leadership, maintaining a stakeholder orientation, inculcating a conscious culture, and embracing a higher purpose. Several ways for a company to be a better corporate citizen are identified and discussed. The so-called business case for being charitable is examined. Seven ways for achieving competitive advantage through good corporate citizenship are posited. Six ways to put corporate responsibility into action are identified and discussed. Sustainability needs to move from being integrated into business strategy to being a foundational element from the beginning as companies adopt futures thinking utilizing sustainability and ethics officers, and as CEOs champion principles throughout their organizations. Corporate Social Responsibility traditionally focused on environmental, social, and governance issues as responsibilities companies faced, but a shift is needed toward viewing these issues in terms of integrity, for example, shifting from a duty and expectation perspective to an internally held moral code. David Gebler examines how values-based ethics programs can help employees' judge right from wrong. Seven levels of an ethical organization are presented and analyzed. How does a manager design honesty into her/his organization? Is it possible to design in honesty and make the concept of honesty part of an organization's culture? This article argues in the affirmative and offers six key steps toward designing honesty into an organization. For ethics to play an impactful role in an organization, ethics managers need: direct access to the board, to collaborate with other functions, to adopt an oversight role, to expand ethics communications throughout the organization, and to monitor and measure performance. Behavioral ethics can help identify ethical risks such as ethical blindness and moral disengagement, and can provide guidance for training and reinforcement, communication and awareness, and monitoring and accountability. In an excerpt from Dana Telford and Adrian Gostick's book, Integrity Works, they present a look at business leader Warren Buffett's practice of hiring people based on their integrity. A list of twenty questions is presented that might be asked of job candidates to learn more about their character. Diversity and inclusion need to ensure equity for all who are a part of an organization. To achieve such equity, three trends have come to the fore: CEOs speaking about equity, expanding representation to include retention initiatives, and fostering inclusive cultures. Organizations need to safeguard against sending the wrong signals regarding diversity training, i.e. that managers inherently have a problem that needs correcting. When conducting diversity training, it is imperative to do so with quality, and to operationalize the components of the training. Building diversity takes time and requires effort to make it stick. It is not simply a matter of issuing a new policy but creating a culture shift. Language and concepts that, traditionally, have been used in sexual harassment training could cause adverse effects. A more comprehensive and effective approach includes empowering bystanders to act, encouraging civility throughout the workplace, training seriously and often, promoting more women, and encouraging reporting. To overcome fraud, managers need to pay attention to opportunity, financial pressure, and rationalization, and to encourage whistleblowing. What are important considerations in developing a global code of ethics? 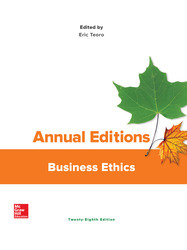 An eight-stage framework for global business ethics is developed. The framework begins with the stage of understanding the orientation of a firm and concludes with recommendations for promulgating and using a framework of global business ethics. Ethical violations do not have to violate the law but reporting them could result in adverse consequences for the informant. Tugend offers some advice to those contemplating whistleblowing. In an empirically based article, the author explores the regret felt by individuals in situations of not blowing a whistle when a whistle should have been blown. The reasons for not blowing the whistle are documented by empirical research. Fear of retaliation is the most common reason reported for not blowing the whistle. The level of regret experienced is related to the type of reported wrongdoing that was not reported. Companies face increasing challenges with respect to social media abuse by employees. Management needs to create social media policies and train employees on them. It is important for employers to focus information gathering on what is relevant for the job, ensuring that the information directly pertains to job description qualifications. Targeted recruitment ads often intentionally exclude older workers. Some companies defend such actions as a way to cost-effectively attract entry-level recruits. The codependence between advertisers and services like Facebook complicates the ethics of data collection, especially when personalized marketing is at the fore. Government regulators and industry insiders respond with initiatives to enhance individual privacy. Three industry experts engage in Q&A regarding the ethics of big data collection. Marketers have used psychographic research for decades. Social media platforms have increased the ability of marketers to obtain personal information, analyze it, and then utilize it, that is, the current ethical challenges of data usage have been in the making for years. Advertisers explore their usage of technological, data-driven marketing. Studies have shown that consumers’ selective memories and unethical amnesia make it difficult to shop ethically. Companies can help consumers by reminding them at multiple points regarding their products’ ethical attributes. Using McDonald's as an example, the author discusses contrary opinions regarding marketing to children. Critics claim that businesses exert undue influence on children, often with seriously negative consequences. Supporters state that parents have the right and responsibility to determine the lifestyles of their children. There is a fine line between hooking a consumer via quality products and advertising, and consumers becoming hooked in an unhealthy addictive way. Individuals benefit from recognizing six signs of behavioral addiction. Designers need to develop and utilize an effective code of ethics given the growing ability of AI, surveillance, and associated product capabilities. They can learn lessons from established professions such as priests, doctors and lawyers. Retouching has led to several ethical problems including unhealthy self-image issues. The problems are not confined to human images, though; product images often are manipulated to create meanings that are false. Volkswagen violated ethics in what has become known as Dieselgate. This article explains what happened and the different national outcomes. This case study on Deutsche Bank’s money-laundering schemes explains that the bank failed in its fiduciary responsibilities, and that it suffered from institutional corruption and conflict of interest issues.